Stadshotellet — Your home away from home. Stadshotellet is a cozy hotel with old ancestry, located on the pedestrian street in Jakobstad – Pietarsaari. Behind the more than century-old facade there is a modern hotel offering personal service and atmosphere. We take pride in our friendly staff and the fact that we always try to go the extra mile to make our guests feel at home. Our restaurants fulfill all your wants and needs in terms of food & beverage. 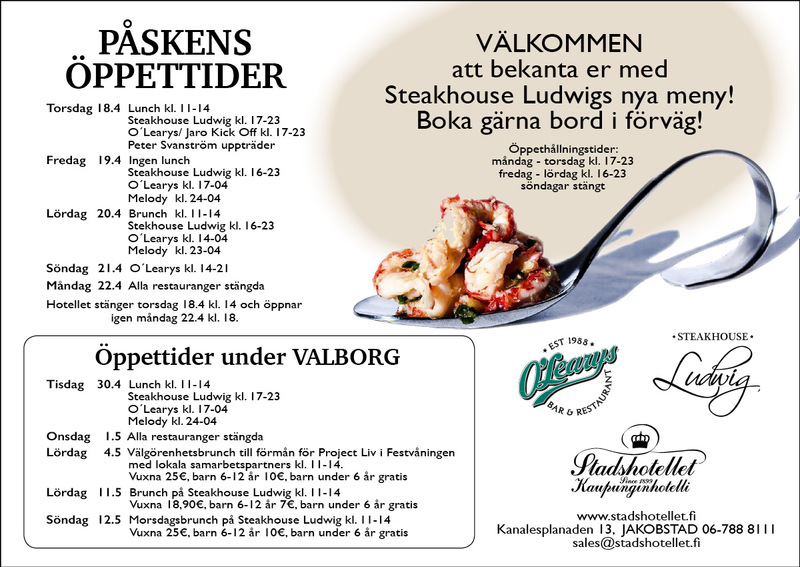 Did you know, that Stadshotellet has one of Jakobstad’s most popular lunch restaurants? Dance the night away at Melody Nightclub with DJ’s playing every Friday and Saturday. Moody Live has a more mature vibe, often offering live entertainment. Let us create the conditions for a successful business event or party! Looking for a venue for a wedding party or a business event? We offer perfect options for various occasions, and our restaurants can be booked also for private use. We are also happy to help you compose a menu suitable for whatever the occasion might be.